EU devoted €18 million to help Eastern Partnership countries and Russia fight against climate change. 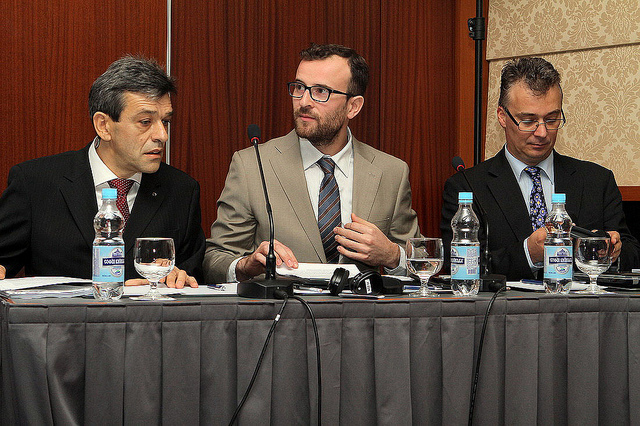 Clima East project, launched by the EU to reach this goal, was presented in Kyiv on October 14. Climate change raises challenges that go beyond national borders, demanding that countries work together to mitigate the negative impacts of global warming. In recognition of the problem, the EU is funding the Clima East project to support Russia and Eastern Partnership countries in reducing greenhouse gas emissions and preparing to deal with the impacts of climate change. On October 14, the Clima East project held a national workshop to educate the Ukrainian public on its main goals and the current challenges in the field. Although the EU and Ukraine expect to sign the Association Agreement in late November, “Ukraine already harmonises its environmental legislation with EU norms,” noted Jean-François Moret, sector manager of Energy, Environment, Green Economy and Civil Protection at the EU Delegation to Ukraine. He added that the Clima East project will assist Kyiv in implementing reforms that support the conditions of the Association Agreement. “The Clima East overall budget equals €18 million,” Moret underlined, adding that the money will be split into two parts, with €7 million allocated for the project’s policy component and the remaining €11 million invested in a number of pilot projects run by the United Nations Development Programme (UNDP). “One Euro invested in flood protection saves six Euro on the costs of flood damages,” said Zsolt Lengyel, Clima East’s team leader and a key climate change expert, justifying the investment of money in climate change mitigation and adaptation measures. Speaking on Clima East itself, Lengyel stressed that the project’s goals are flexible and can be adjusted depending on each country’s specific needs. The project will work in cooperation with similar initiatives financed by the European Bank for Reconstruction and Development (EBRD) and the US Agency for International Development (USAID) in order to achieve a synergy effect. Valentyn Shlikhta, head of the GHG Emissions Cadaster unit at the State Environmental Investment Agency of Ukraine, says that “Kyiv intends to reduce its greenhouse gas emissions by 20% compared to the level of 1990”. According to Shlikhta, Ukraine also wants to “develop and implement the National Action Plan on mitigation and adaptation to climate change by 2030, and to increase the use of energy sources with low CO2 emissions by 20% in 2020.” The official also underlined importance of EU-Ukraine cooperation in the environmental field, stressing that the Association Agreement commits Kyiv to implementing the relevant EU acquis within two years of the document entering into force. Glib Stregunenko, the key specialist at the department of strategic policy and investment at the Ukrainian Ministry of Energy and Coal Industry, expressed his hope that the Clima East project would help Ukraine meet the ambitious goals for the year 2030 set out in its energy strategy. “Kyiv intends to attract $200 billion to the country’s energy sector by 2030,” Stregunenko said, adding that the money would enable Ukraine to increase its energy efficiency by 35%. Clima East is a four-year project funded by the European Union supporting the European Neighbourhood Policy (ENP) East countries (Armenia, Azerbaijan, Belarus, Georgia, Moldova, and Ukraine) and the Russian Federation in adapting to and preventing climate change. Specifically, the technical assistance project intends to bring climate change policies, strategies and market mechanisms in the partner countries more in line with EU norms by supporting regional cooperation and improving access to information on EU climate change policies and acquis. A pilot project component run by the UNDP will demonstrate the relevance of environmental management techniques for climate change mitigation and adaptation.